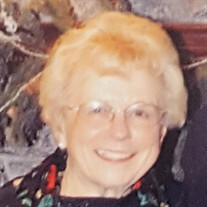 Shirley Ann Massman, a resident of Lake Lure, NC, formerly from Frankenmuth, Michigan, died on November 25 at the age of 86. Born on December 22, 1931, in Saginaw, Michigan. At the age of 16 she graduated from Arthur Hill High School with the class of 1948. Shirley went on to work at the Saginaw Transmission Plant (later Saginaw Manufacturing) in Saginaw where as a pioneer for career women she was one of the highest ranking women within General Motors for many years. Shirley retired to Lake Lure, NC, where she was an avid golfer having scored not one but three holes in one in her lifetime. Shirley is survived by her loving husband of 47 years, Duane Massman; her sons, Thomas Tagget (Kelley) of Frankenmuth,MI, Todd Tagget (Cathy) of Reno, NV and David Tagget (Sara) of Ellicott City, MD, her stepson Dean (Pam) Massman of Melbourne, FL, her brothers Robert Harger (Fina) and Bruce Harger (Linda), her sister-in-law Kay Harger, the sister she never had Helen Burden (Gordon) -and her grandchildren Remington Tagget, Dillon Tagget, Blake Tagget, Dale and Drew Massman, and Kristin Clear. Shirley was predeceased by her parents Margaret and Walter Harger, her husband of nearly 20 years William J. Tagget, her granddaughter Katrina "Kara" Tagget, her brother Richard Harger, her stepsons David and Daniel Massman, and the best dog in the world Kinder. A Memorial Service will be held at 11 a.m. on Saturday, December 15, 2018 at Fairfield Mountains Chapel Lake Lure, NC, with the Reverend Everette Chapman officiating. Friends are invited to celebrate Shirley's life. Hospice of the Carolina Foothills, Box 336, Forest City, NC 28043; or The Fisher Center for Alzheimer's Research Foundation, 110 East 42nd Street, 16th Floor, New York, NY 10017.